Does your family take part in taco Tuesday each week? If not, it's a tradition that is something to look forward to, and the great thing about tacos is that you can switch up the recipes to make it interesting and unique to taste. Here are 10 taco recipes to help spice up your taco Tuesday! Slow Cooker Cuban Pulled Pork Tacos: This recipe tastes just as delicious as it looks! A combination of pork and spices, these tacos will liven up your Tuesday evening with the family in no time. Click here to check it out! Chicken Tacos with Cucumber-Avocado Salsa: Nothing like avocado to add some zest to your tacos! Check out this chicken taco recipe with cucumber-avocado salsa that has delicious flavoring the whole family will enjoy. Skinny Spaghetti Squash Tacos: These skinny spaghetti squash tacos make an impressive presentation and are a fun way to put veggies in the mix. With no meat and colorful ingredients, this recipe is one to try! Greek Tacos: Give your tacos a twist with Greek seasoning, spinach, and feta in the mix. It takes barely any time to prepare and will serve up to six people! Click here for the recipe and instructions. 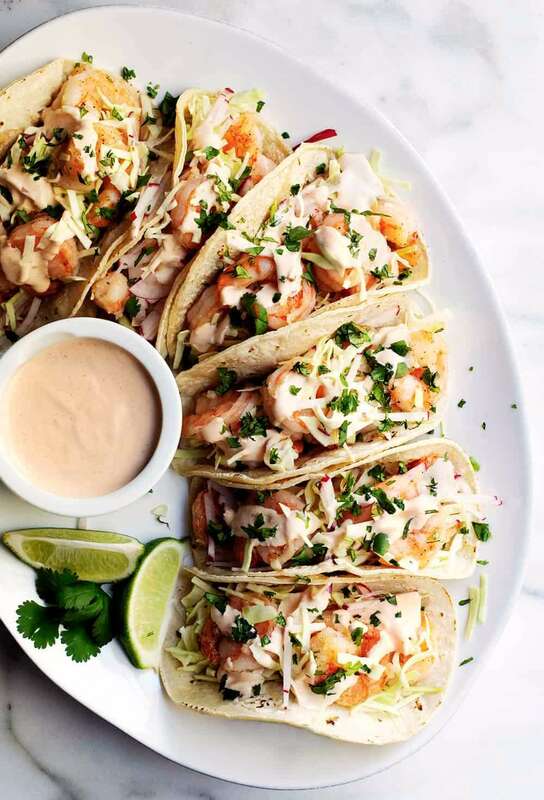 Shrimp Tacos: Get a taste of the sea with this shrimp taco recipe. It's a super flavorful recipe, that's easy to make. Click here to check it out! Lighter Beef Tacos: This Martha Stewart recipe only takes 20 minutes to prepare using a combination of lean ground sirloin and low-fat corn tortillas. Healthy and delicious, your kids won't even know that it's a lean meal! Vegan Tacos: For all of those vegans out there, check out this recipe that will send your taste buds soaring! Tacos can taste just as perfect without the meat, so click here for the recipe and instructions. Turkey Taco Lettuce Wraps: Don't let the "lettuce wrap" refrain you from trying this recipe. These turkey taco lettuce wraps are great for nights when you're in the mood for a no-carb speciality! Taco Cones: Are you in need for a unique taco recipe for the kids? They will be blown away by this taco cone recipe! It gives a great presentation and will leave you craving more. Slow Cooker Chicken Black Bean Tacos: Less than 330 calories per serving, you can't go wrong with this slow cooker chicken black bean taco recipe. Give it a try and click here for the recipe!